Violets are one of the cheeriest little flowers to grace the landscape. True violets are different from African violets, which are natives of east Africa. Our native violets are indigenous to the temperate regions of the Northern Hemisphere and may bloom from spring well into summer, depending upon the species. There are around 400 types of violet plants in the genus Viola. The many violet plant varieties guarantee there is a sweet little Viola perfect for almost any gardening need. True violets have been cultivated since at least 500 B.C. Their uses were more than ornamental, with flavoring and medicinal applications high on the list. Today, we are fortunate to have a plethora of different types of violets readily available at most nurseries and garden centers. Violas encompass the dog violets (scentless blooms), wild pansies and sweet violets, which are descended from wild sweet violets from Europe. With so many choices, it can be hard to decide which of these endlessly charming flowers to choose for your landscape. We’ll break down the basic different types of violets so you can pick the best fit for your garden. Both pansies and violets are in the genus Viola. Some are perennials and some are annuals but all sport the sunny, uplifted face-like flowers characteristic of the family Violaceae. While both are technically violets, each has a slightly different characteristic and genesis. Pansies are a cross between the wild violets, Viola lutea and Viola tricolor, and are often called Johnny-jump-ups for their ability to crop up readily anywhere. Sweet violets are descended from Viola odorata, while bedding violets are deliberate hybrids of Viola cornuta and pansies. The mounding form and leaves are the same, but pansies have more distinctive “faces” then bedding violets, which feature more streaking. Any of the types of violet flowers are equally as appealing and easy to grow. None of this is very important unless you are a breeder or botanist, but it serves to indicate the huge array of varieties of violets and the need for a larger classing system to indicate species variation among the family members. Bedding varieties are your hybridized violets and pansies. 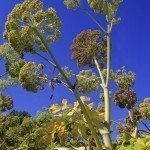 In late winter, they are the most commonly found in nurseries and thrive in the cool of early spring and even late winter in temperate and warm regions. Wild violets are less common but may be found at native nurseries since 60 species are native to North America. Every region will have slightly different offerings but there are some mainstays in the Viola community. 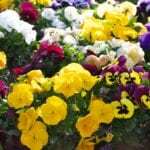 The garden or bedding pansies, which are a hybrid, come in numerous colors, from blue to russet and anything in between. Blue violets are the most common and will readily seed themselves in your garden. Wild Violas for sale may be field pansies, yellow wood violet, hairy violet, dog violet, downy yellow or early blue violet. All these types of violet plants should thrive in dappled light, well-draining soil and average moisture. Most will self-seed and double the dainty flower display the next year. Violets of any name are one of nature’s sweet treats that shouldn’t be missed in the landscape. Read more articles about Violets.